Do you have a regulatory question you don’t know the answer to? 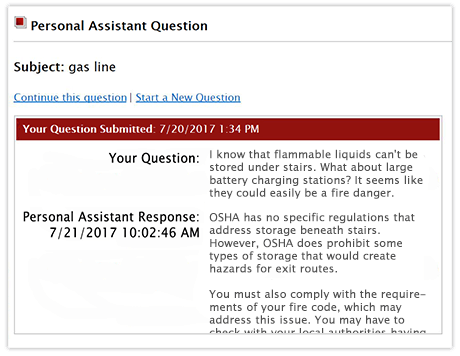 You can ask it publicly in our safety discussion boards or privately in the Personal Assistant tool. This tool offers you direct contact to J. J. Keller's team of experts, with over 400 years of combined experience, who can answer your toughest compliance questions in a private and secure environment. This invaluable tool is like having your own compliance assistant right at your fingertips for your workplace safety, transportation or human resource questions. 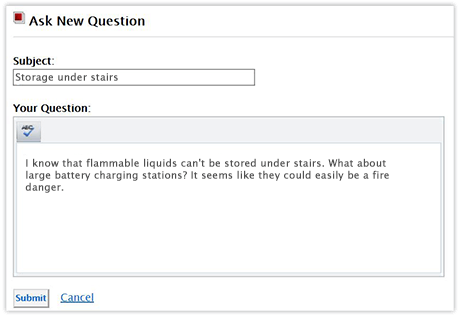 Get the answers you need with KellerOnline! "I utilize the Personal Assistant feature a lot and it is one of the best resources for finding answers to difficult questions." Using the KellerOnline® Personal Assistant tool couldn't be easier! Simply type in your subject and question in the form provided and click submit. Our compliance experts are generally able to respond within one business day. If your question is beyond the scope of what we can cover, we will make every effort to refer you to a more appropriate resource. Get the answers you need to your specific compliance-related questions!